As usual my kids are picking the creepiest costumes they can think of. This year, Danger Girl wants to go as Buster the Crash Test Dummy and Punky Brewster wants to be Little DEAD Riding Hood. I haven't gotten started on those costumes yet, but figured I'd share the details on our costumes from last year. Danger Girl was a Weeping Angel from Doctor Who. If you don't know the Weeping Angels, then let me explain briefly. You know those angel statues in cemeteries that are often seen crying? They are really monsters that are quantum locked in place. That means they can only move if you aren't looking at them. Even blinking means they can move. . . and attack you. But they don't kill you. It's worse. The weeping angels send you back in time and live off your potential life energy. When we did Danger Girl's costume, we started with some grey fabric, a grey T-shirt, foam core from the dollar store, grey paint and LOTS of grey face paint. This was for a 9 year old and not for a convention cosplay. It was meant to last one night. We took the grey fabric and made a long grey skirt with a basic elastic waist. The top was done in an extremely basic tunic style: A rectangle folded in half, then a spot for the head was cut out. The tunic was placed over her basic grey long sleeved T.
Over her head, we made a bandana to cover her blonde curls. With school the next morning, we really didn't want to deal with washing hair color out. It was going to be bad enough getting rid of the grey face paint! 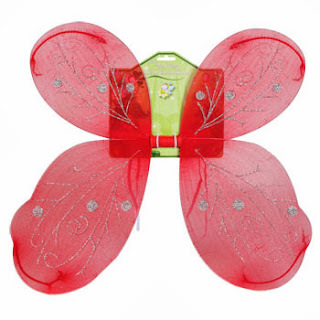 Our foam wings had a "bar" holding them to the back and elastic to slide over her arms. Many people asked what she was supposed to be. That's pretty expected with my kids' costumes. Her costume is awesome! And what a great pick it's original. Hope you have a great day. Parenting: You're doing it right. I would know what is she if she came to my door. 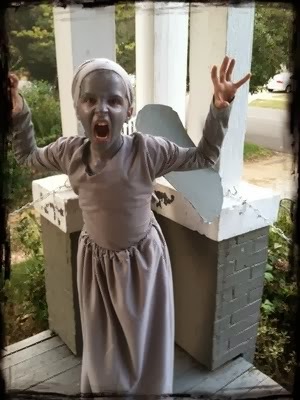 She might get extra candy because Weeping Angels are one of the scariest monsters in Dr. Who! My oldest son was a weeping angel a few years ago, keeping his hair out of the way was the hardest part (he has a huge fro!) otherwise it's pretty easy isn't it, just grey stuff! I ended up making a sort of grey balaclava type hood to hold it all in. He is pretty tall & skinny so last year was the Silence which was also easy (we did get a mask free on a Doctor Who magazine) he just wore his school uniform which is black trousers & jacket, with a white shirt & black tie and we re used the hood. He then spent a lot of time moving creepiliy towards people pointing his fingers at them and putting his head to one side! I've seen some great Doctor Who based costumes around, the programme gives such a great source of inspiration and not always too difficult to create. I think getting the kids involved with creating costumes is so much better than just buying something, your daughter looks great and her face is amazing - very scary! If she had come to our house we would have known what she was straight away and she would definitely have got bonus sweets for a great costume!